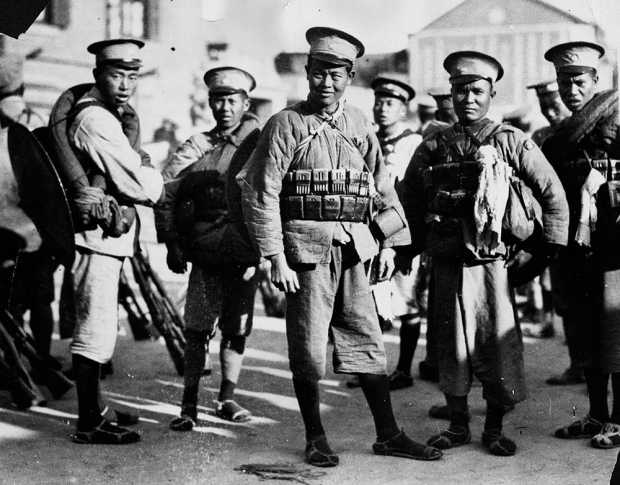 Cantonese soldiers pause for a photograph in their newly-supplied Russian equipment after arriving at Hankow as reinforcements for the Red Garrison, 1927. Harvard University Press, 369 pp. This article was first published in The New York Review of Books on May 28, 1981. In the Chinese united front of the mid-1920s, the Soviet agent Borodin has been a protean figure. Bringing Leninist skills, arms, and advisers to Canton, he seemed to be the priceless ingredient that finally catalyzed Sun Yat-sen’s revolution. Borodin drafted the Kuomintang’s constitution and taught it how to be revolutionary long enough to take power. He really put the Kuomintang (KMT) in business. By rights there ought to be a bronze statue of Borodin at one of those big intersections in Taipei. Dan Jacobs, however, seems a bit shrill when he opens his book with “Borodin, the Bolshevik conqueror of half of China.” He has written a readable and judicious summary of Borodin’s career as depicted in English and Russian sources, a worthy achievement made possible by entirely neglecting the much more extensive sources still in Chinese. He should not claim too much. Bringing Borodin’s career into verified form is a contribution even if it leaves him still badly out of focus. First, on Borodin’s early career, Dan Jacobs makes plain that he began as a true Bolshevik, in on the ground floor of Lenin’s movement. Borodin’s original name was Mikhail Markovich Gruzenberg (1884-1951). A Russian Jew from Riga, he was among the first hundred Bolsheviks to follow Lenin from 1903. He joined him in Switzerland in 1904. He already spoke Yiddish, Russian, German, and Latvian and was an able fixer among the fanatically disputatious social democrats. At the Bolshevik conference in Finland in 1905 he met the Georgian Koba-Ivanovich-Djugashvili, later to be known as Stalin. They worked together at the Stockholm conference in 1906, where Borodin at age twenty-one was a rising young revolutionary leader. But then one of those funny things happened. He had to go back to square one and start over. In 1906 Borodin was arrested by the Tsarist police and deported to England. He soon crossed over to Boston. By 1908 he was attending Valparaiso University at Valparaiso, Indiana, and in 1909 he began teaching English to immigrants at Hull House in Chicago. He also ran his own night school, the Berg Progressive Preparatory School. This American career, complete with family, gave him a self-taught education plus perspective and flexibility. It made him an Americanized Russian, which made all the difference when he got to China and dealt with Americanized Chinese. When Borodin returned to Russia in July 1918, after twelve years abroad, he saw Lenin again, then worked conspiratorially for six months in Scandinavia. After the Comintern (CI) was set up in 1919 he soon became one of its top agents. He carried funds for CI work to Germany, Switzerland, and Holland and tried to get Carl Sandburg and Jane Addams to smuggle funds to Chicago. 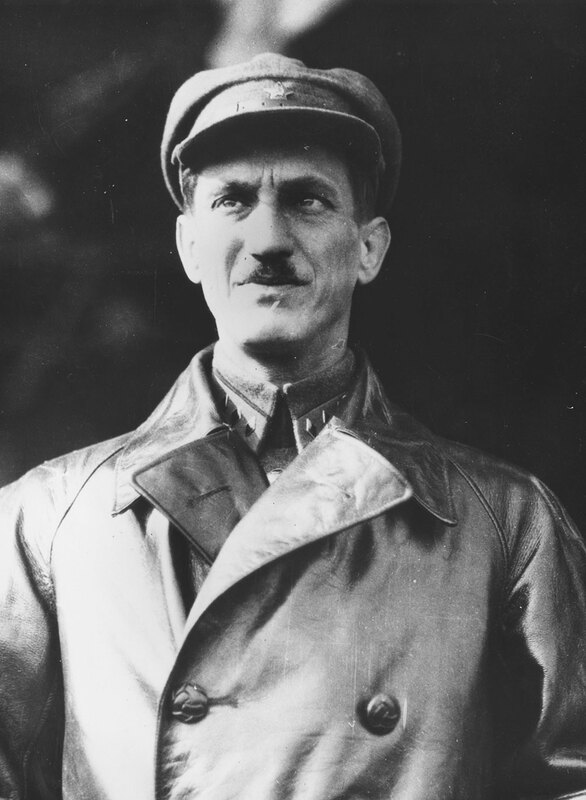 Coming back to America he went to Mexico City and helped found the Mexican CP in 1920. After helping also to organize the second CI congress in Moscow, Borodin worked mainly in Germany and then in early 1922 in Britain, winding up in jail for six months until he was deported back to Moscow. Jacobs finds no evidence, contrary to widely accepted legend, that Borodin was ever active with Kemal in Turkey. When Borodin met Sun Yat-sen in Canton in 1923, they found they were made for each other. They were both copiously, persuasively eloquent, utterly sincere, and intellectually unprincipled. The Comintern agent at age thirty-nine brought to Canton the precise where-withal that Sun needed—blueprints for the Kuomintang as a centralized Leninist party dictatorship, a promise of arms for an indoctrinated party army under Chiang Kai-shek, techniques of training for mass mobilizers like Mao Tse-tung. After Borodin arrived in October 1923, Sun Yat-sen, at fifty-seven, had only a year and a half to live, but in that time he accomplished as much as in the thirty years preceding. As the revolution came to a climax, Borodin was a chief factor in KMT history. Borodin, née Mikhail Markovich Gruzenberg, (July 9, 1884 – May 29, 1951), seen here in February 1925. Sun in his own late thirties had toured the world scrounging funds from the overseas Chinese for a promised revolution, selling franchises on the future. Borodin recently had slipped across dozens of national boundaries but he was dispensing Comintern money from a center of world revolution already in being. To China he brought the energy and self-confidence of a successful practitioner. His part in Sun’s final achievements at Canton was important—but how important is still a matter of dispute. When Borodin reached Canton to be the Soviet politburo’s special adviser to Sun, the KMT entente with Moscow had already started. Chiang Kai-shek was in Moscow to learn, about party armies. And Stalin, struggling for power against Trotsky, was committed to a united front between the KMT and the Chinese Communists (CCP) and, in effect, building up the KMT as the necessary vehicle for China’s bourgeois revolution. Borodin’s task was to carry this pro-KMT policy into effect, and he did so. In mid-November 1923, for example, warlord forces threatened to seize Canton and force Sun and his KMT central executive committee (CEC) to flee yet again from their revolutionary base. Borodin’s early proposals to mobilize mass support by distribution of absentee owners’ land and higher wages to workers had gone unheeded but now he beat the drum of reform more loudly as the only way to save the regime. By great effort in rounding up 500 volunteers, he principally checked the warlord advance. Sun Yat-sen refused for a week to approve the reform program but when Borodin finally saved the day, he became Sun’s Lafayette and from then on had the inside track. The first national congress of the KMT (hitherto a conspiratorial society) in January 1924 reorganized the party on Leninist lines, accepted dual membership of CCP members as individuals, authorized the establishment of the Whampoa Military Academy (with Chiang Kai-shek as its first commandant), and gave CCP members key posts in the KMT structure. Borodin’s mission included about sixty Soviet advisers all told, several of whom, like A.I. Cherepanov, left extensive accounts. In Jacobs’ bibliography of, say, 350 books and articles, about 125 are in Russian and the rest mainly in English, none is in Chinese. Borodin’s link to Sun Yat-sen was his fluent English as well as his Chicago vocabulary of progressivism and reform. The two men got together on the Americanized side of their personalities—Sun had gone to school in Honolulu. Few among Borodin’s Soviet team had much command of Chinese or of English. Borodin as their chief singlehandedly argued his points in English, which was also the language used by Eugene Chen, the Trinidad barrister who became foreign minister. What we get from the Soviet record is a foreshortened Soviet view of Stalin’s man Borodin standing ten feet tall. It is not unlike Protestant missionary hagiography in which “the Chinese” form the target, the environment, the audience, and the obstacles but not the chief protagonists. The Borodin legend, for example, has it that Borodin pressured Dr. Sun into presenting his lectures on the Three People’s Principles in order to have a canonical statement of the leader’s ideology. Dr. Sun had been talking for thirty years but was a man of speech, not of the Chinese written characters. Once given, his discursive lectures soon formed the basis for Sun Yatsenism, which for years has dimmed the KMT appeal to intellectuals. Jacobs says nothing of this, presumably because his Soviet sources spent little time on Chinese writings. To put this source problem in perspective let us note that Chiang Yungching’s 453-page monograph Pao-lot’ing yü Wu-han cheng-ch’uan (“Borodin and the Wuhan government”), published in Taipei in 1963, deals mainly with the eight months from December 1926 to July 1927 when Borodin was playing out the last act of his Chinese tragedy in the capital that had been set up by the left wing of the KMT. Jacobs deals with this period in about sixty pages with sixty footnotes. Chiang’s monograph in Chinese devotes to it about 400 pages and nearly 1,000 footnote references, many of them to some nineteen sets of KMT government CEC minutes of policy debates. Chiang cites some documents in English translation but not the secondary literature in Western languages and nothing in Russian. These two authors have worked opposite sides of the street. Meanwhile an unfinished doctoral study by the late Lydia Holubnychy, Michael Borodin and the Chinese Revolution 1923-1925* cites still other Russian and Chinese sources evidently neglected by both Jacobs and Chiang. The most comprehensive account of the Kuomintang-Comintern alliance and First United Front that Borodin stood for is by Li Yun-han in Chinese (Ts’ung jung-kung tao ch’ing-tang, “From the admission of the communists to the purification of the Kuomintang”) published in Taipei in 1966. An English version is needed so that the Soviet role within the KMT can be seen in its Chinese setting by us outsiders; perhaps in due time this will appear in the Harvard East Asian Series. Granted that Russian and English are today the superpower languages, the revolution in which Borodin was acting was recorded mainly in Chinese. Several things underrepresented in Jacobs’ account are necessary to get Borodin in perspective. The first is the rise of the left KMT. Borodin had his impact on the Chinese revolution as part of the leftist interlude in the history of the Kuomintang. As a foreign adviser he could never be a principal political figure in the Chinese competition for leadership within the Nationalist movement. What he offered had to reach the scene of action through a Chinese protagonist. He was a short-term catalyst who helped others to achieve power, after which he became utterly expendable. Even before he won Sun Yat-sen’s confidence in late 1923, Borodin had found an ally in Liao Chung-k’ai, the leader of the left KMT. Liao had been born and educated in San Francisco. He also attended Waseda University in Tokyo and graduated from Chuo University in 1909. With this American-Japanese background, he met Sun in 1903 and became a close disciple. In 1911 and later, in 1917 and after 1921, Liao became financial commissioner for Kwangtung, the chief money raiser of the Canton government. Having long been a socialist by conviction, he finally became Sun’s expert on the Soviet connection. After the Soviet agent A. Joffe had set up that connection in January 1923, Liao went with him to Japan to learn all about the possible benefits of collaborating with the USSR. Liao was thus central to everything Borodin did. When assassinated at age forty-seven on August 20, 1925, Liao was governor of Kwantung, a member of both the government and military councils, KMT representative at Whampoa Military Academy, and head of the workers’ department. He had become a prime mover in every development that Jacobs attributes to Borodin. Naturally, the demise of Sun and then of Liao in 1925 left Borodin in a tough spot. Up to this point he had been the central Soviet operator in Canton of the left-KMT line based on cooperation with and learning from the USSR. Sun Yat-sen University in Moscow, set up in 1925, was attended in the next two years, at Moscow’s expense, by well over a thousand Chinese middle school and university students selected by the CCP. But few of these trainees came back to China in time to beef up the left and help Borodin in the united front. At the end of 1925 his left-KMT position held the balance between the small but active CCP membership in the KMT and the potentially preponderant right wing of the KMT. The creative beginnings of the revolutionary year 1925 had produced a momentum that carried on into 1926. At the second KMT congress in January Borodin worked through Wang Chingwei, the eloquent nonachiever who had inherited the left-KMT leadership. At this point Jacobs gets carried away by his Russian informants and writes as though Borodin were actually the power holder at Canton, which is nonsense. Soviet arms, ideas, and organization gave him influence but he had to maneuver among patriots who spoke only Chinese. Chiang Kai-shek, now commander of the National Revolutionary Army, cracked down on the Soviet influence by his coup of March 20, 1926, which was of course followed by profuse apologies. Borodin was then in North China (from February 4 to April 29). After he got back to Canton he helped send off Chiang’s Northern Expedition, which soon took over the Yangtze valley, but his influence in Chinese politics was already on the skids. Borodin’s adventure in China was made difficult by a basic factor that Jacobs makes quite plain—the fact that the Nationalists as a whole were opposed to social revolution, i.e., either land redistribution or workers’ organization. To say that China lacked a proletariat was only a pale reflection of a basic situation that Marxist class analysis could not quite encompass. The principal inadequacy of all writers on Borodin is the unreal set of assumptions that has been handed down to them by the conventional wisdom of 1920. In brief, this posited that the KMT was a middle-class or bourgeois movement in search of a bourgeois-democratic revolution whereas the CCP was after a proletarian revolution. This transposition of parochial European terms onto the Chinese scene never fit well. It put the revolutionaries of the time into constant hot water as their words failed to suit China’s realities. It has left the events of the 1920s in China under an opaque cloud of argument in retrospect. A new look needs to begin with a redefinition of terms in Chinese politics. Class analysis has been misleading. The KMT after it came to power at Nanking was like a new dynasty. It proved to be a new ruling group devoted to maintaining itself, not to representing the interests of a capitalist-minded bourgeoisie. The KMT in power did little to help any capitalism but its own. It terrorized, squeezed, and dominated Shanghai businessmen and gave them no scope for entrepreneurship. Borodin similarly knew better than to think that the CCP represented a proletariat. He advocated reform to enlist worker and peasant support and mass mobilization to provide a base of CCP power. But as a realist and working politician, he had to deal with the political factions that formed around Chinese leaders in much the traditional manner. Organization by personal loyalty took precedence over organization according to ideological principle. In such a game, of course, no foreigner could compete, as General Joe Stilwell found out twenty years later. Borodin made it back to Moscow in 1927 and found his niche after 1930 as editor of the English-language Moscow Daily News. He was arrested in 1949, survived two years in a labor camp near Yakutsk, and died in 1951, two years before Stalin. Jacobs’ Borodin will be much appreciated as an informative biography. We still need the history that will place Borodin in his complex setting.